With much talk of how design can shape social behaviour, and politicians taking a renewed interest, this article examines the link between design and politics. Has a product’s aesthetic lost the power to signal affiliation to a political value system and are designers always aware of the political implications of their work? As “matter” that we must negotiate, products can literally shape our daily experience in ways that spark particular thoughts, and designers can therefore influence what these thoughts are. In addition, objects have the ability to be the locus of discussion about our potential futures; to explore through objects, the logical conclusions to certain models of thought, be they politically partisan, positive (utopian) or negative (dystopian). Yet beyond a small band of critical designers and activists, the design world is not a hotbed of political debate and most designers neither wear their political agendas on their sleeves, nor make them explicit in their portfolios. Hence the link between design and politics that undeniably exists is downplayed and often overlooked entirely. For its confirmation we need only remind ourselves that the key differentiator between the three main socio-political systems, Communism, Socialism and Capitalism, is who controls the means of production and how it is operated. Designers, while not directly in control, are nonetheless in the business of negotiating with industry the ways in which production is applied, and the choices possible within this role can be made with particular goals in mind. If design is used to influence or change anything, or even to maintain things as they are, it is exerting power and is therefore a political tool1. Those goals may be political with a large or small ‘p’, that is, they may or may not be part of a ‘big picture’ of how a country or a society should operate. Enzo Mari’s point (above) is that many designers act out their role without ever considering these political ramifications. Just as the reasons for applying a style can come from either side of the political spectrum, they may also have been arrived at without any intentions other than personal aesthetic preference. We must also remember that the political location of a product is defined not just by its image or purpose but also by a variety of factors including to whom it is financially available and by whom it is actually consumed. With the gradual dismantling of class barriers, the converging of left and right in mainstream politics, and emergence of Postmodern views, these old aesthetic signposts have become historical relics. Where, for example, should we politically locate Apple’s iPod? (fig. 1) Its clean lines, uniform radii and undecorated surfaces, not to mention its harnessing of new technology, place it in an historical line that leads us back through Dieter Rams, Braun’s influential chief designer from 1965-1995 (fig. 2) to the Socialist Modernism of Germany’s Bauhaus School. Yet with its bright white earphone wire, shiny case and high price tag ($400 or around £280 when first released) it is a potent sign of capitalist conspicuous consumption. More extreme still, the recent phenomenon of Design-Art, whereby designers produce furniture for the price of an average house, is a state of affairs that, politically, could hardly be further from the social project of harnessing production methods to provide quality goods for all. Beyond the aesthetics of the object lies what has become known as the aesthetics of use (4), and this too can imply political leanings. Our perception of the intended use of a product may be towards selfless or indulgent ends, practicality or frivolity, modesty or ostentation, engagement or denial, with advertising and branding helping shape these verdicts. This aesthetic of use extends to the product’s effect upon its users and those around them, upon its environment and the environment in the wider sense. Hence the aesthetics of using the much-vilified “Chelsea Tractor” on a short school run are politically loaded, as is carrying your shopping home in an Anya Hindmarch designed fabric bag sporting the legend “I’m not a plastic bag” (fig.3). Fig. 3 Anya Hindmarsh's "I'm Not a Plastic Bag"
Deepening the search for ideological signals, a major although often unseen source is the way in which the design process has been carried out. The debate between the ‘top down’ imposition of decisions and the ‘bottom up’ consultation of the audience is one held on macro and micro levels – in the design of the state and the design of products – and ought to be a fundamental consideration of any design project. The free market is analogous to a democratic government in the sense that the objects of design, like politicians, rely upon a certain level of support (consumption) for their survival. Design that is not in tune with the general public’s desires and expectations may continue to exist but will remain niche (unless those desires change). Designers, realising this, have been taking note of what consumers think and building this into their products for many years. Going beyond simple market research. New design methodologies are apparently making design even more democratic by engaging the public in the design process. So-called Participatory and Co-design methods have appeared, transforming the designer’s role from originator to facilitator. With product designers broadening their remit to include services and offering advice at boardroom level, they are increasingly being called upon to shape the implementation of government policies. Some of these enterprises have been sold to designers as a means of applying their creative skills directly to solve social problems, conveniently ignoring the politically charged nature of the projects themselves. In their keenness to engage their problem-solving abilities, designers must be savvy enough to think through the ramifications of the projects and proposals in which they become involved to ensure they do not become political pawns for a side they do not support. 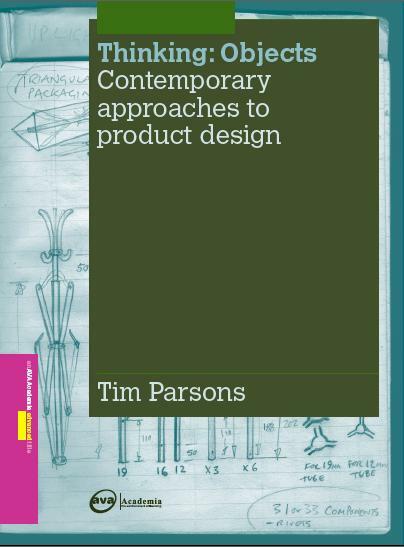 This article has been adapted from the book Thinking:Objects – Contemporary Approaches to Product Design by Tim Parsons, published in 2009 by AVA Publishers, Switzerland. It was also published in Central Saint Martins College of Art and Design’s MA Industrial Design Yearbook 2008 under the title In Search of the Politics of Design. 2. Mari. E quoted in Burkhardt. F Why Write a Book on Enzo Mari, F.Motta, 1997.